oh wow...they luk so yum! Send some over, Manisha tai :). Plz............... :). looks great manisha...I have blogged on paneer paratha..yet to find time to upload aloo..all stuffed ones tastes great! ooh, I could get myself around some of that. You should enter Jaden's contest for a cookbook. 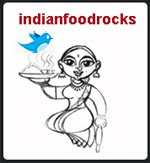 Just enter your favorite Indian dish! These are on top of the comfort food list - an absolute favourite in our home - everyone's probably! And mine look uncannily like yours! I like the mammoth tandoori aloo parantha at Giani's (Old Delhi)too. You have to eat that at least once. Yumm they are lookind so delicious. Puffed Parathas, i can never imagine myself making a perfect one like you manish!! those parathas must be delicious!! 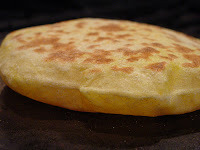 Great parathas - perfectly dont, golden & puffed up!!! Really nice! Wow! you make 13-14 out of one cup of flour? 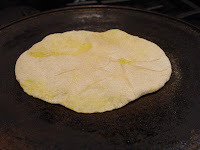 I'm lazy when it comes to roti & parothas - I would only get about 6 :) Love the step by step. I also add green chilies, ginger, amchur & cilantro in mine. Perfect looking parathas. So yummy and good. Umm! Allo paratha, lovely step by step description. 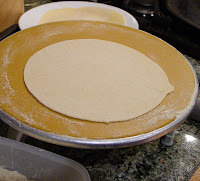 I never tire of eating parathas or seeing pictures of them being made or even of making them! Perfect looking parathas, fresh and fluffy. What else could anyone want:). BTW thanks for providing my link. Its really nice of you. Wow, you are on a roll!! You have been posting like, what, a post a day? All of them lovely too, but as you know I have been away, and am still catching up with so many things. Right now it seems like I am never going to. Thank you, your tips came in at the right time. I am planning to make it this weekend, i am mashing potatoes today, will cook a couple more. The parothe puff up depending on how you roll them. It's not a biggie if they don't puff up, the taste remains pretty much the same! So don't stress on that front! John, I looked at the widget and it's really cool! I like that you can add an image at the top! Incidentally, you can add feeds to your blog using the new Blogger template, too. It's not as fancya s that widget though. I will probably use your widget to display feeds from this blog on my Inner Lens blog. I generally stay with easy and quick fix recipes. Some may have a long list of ingredients but if you organize yourself, the method remains simple. I hope your wife joins you in the kitchen. There's a wonderful charm about cooking with your spouse. Suganya, you have caught Inji-fever. She looks in spoons for reflections and now you are looking at palms! The lifeline on my right palm is much stronger as is my fate line but I think the left hand is what is read. That's about the extent of my palmistry knowledge. Kitt, make sure you buy wheat flour (chapati atta) from the Indian store. It is milled differently. 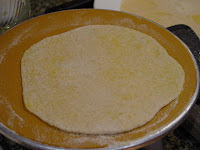 With regular wheat flour, you will get dark and slightly chewy parothe. Thanks for letting me know about Jaden's contest. I am a bit wary of those auto linky thingees so I need to figure that out first. 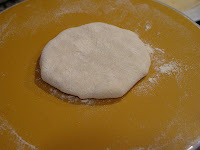 Anita, I usually don't add any oil to the dough when making rotis. So 1 tsp and we are already over the limit. And yes, just 5 drops each side. I count! Also, mine are much smaller. Happy Cook, they're very easy to make so I don't think you should have a problem at all! Alpa, don't be misled by my hands - they're small! Rather incongruous with the rest of my body. 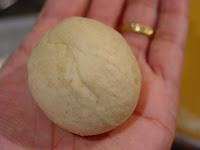 The ball of dough is about as much as I would use for a rotli (roti) and that's as many rotlis I make from a cup of flour. I would add green chillies and cilantro but there are some little mouths that cannot handle chillies and that do not like cilantro pieces in their mouth, even though they love cilantro chutney! I am hoping that one day we will be able to graduate to more things in the parotha! Laavanya, it's actually a little bigger than than the ball of dough. I try to get in as much stuffing as I can. 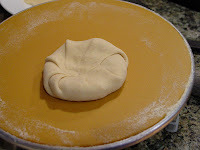 Try roll ing it gently, coaxing it to spread and you shouldn't have it oozing out. Shivapriya, you're most welcome! Your pictures and tutorial are great! I signed up for NaBloWriMo and then NaBloPoMo. It's post a day equivalent of NaNoWriMo. Archana, hope it works out well for you! Thank you for this post, Manisha. 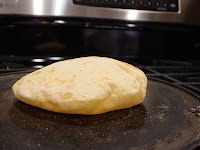 I have always been dissatisfied with my batatyache parothe...they felt thick and doughy. 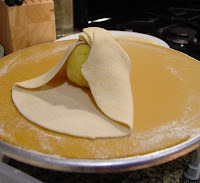 Looking at your recipe, I saw that 1 C atta yields more than 10 parothe! I have been making 8-12 parothe with 2 C atta...no wonder they turned out so bready. 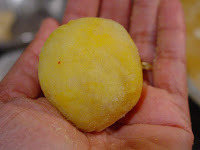 I decreased the ratio of atta: potatoes and tried making these yesterday, and they were tasty and delightful. Thanks so much for helping me troubleshoot. Your recipe is very simple with nice pictures. I have a similar recipe on my site http://www.cookingsimplified.com/?p=80 but with all the greens :) I will try out yours this weekend.